A Java Server Page, or JSP, program is a crucial part of a Java web application because the JSP will send a response back to the server in the form of a web page. For example, a JSP might display the line items of an order to the browser user. 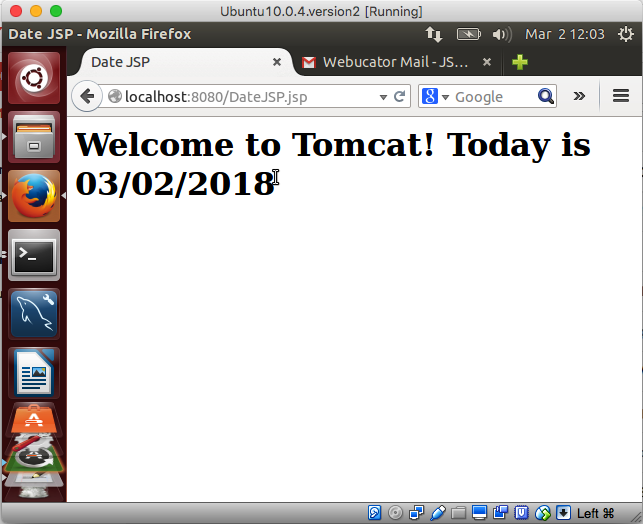 In this topic, you will create a very simple JSP and learn how to run the program at the Tomcat server. The program contains <%@ tags that provide metadata about the JSP and import directives. The JSP also contains HTML tags that will be rendered by the browser in the usual way. Note the <% tags that encapsulate Java code. The snippets of Java code are referred to as "scriplets." When the JSP is requested by the browser, the program will be converted into a servlet by a program in the Tomcat container (Jasper) and the HTML output will be sent to the browser. Save your file as DateJSP.jsp. Copy your file to CATALINA_BASE/webapps/ROOT, e.g., /var/lib/tomcat7/webapps/ROOT. Start your browser if it is not already running. In the address area of the browser, type http://localhost:8080/DateJSP.jsp and submit that address to the browser.